A body scrub is a skin care product thats primary function is to remove dead skin cells through exfoliation as well as cleanse the skin. Body scrubs are great for stimulating blood circulation, which in turn helps the skin regenerate new tissues. Body scrubs are an important skin care product that should be included in your everyday skin care regime. The benefits are some that will greatly improve the largest organ of our body. By removing dead skin cells, you will dramatically improve the appearance and function of the skin. Dead skin cells can block pores and cause a lackluster, dull appearance to the skin. Blocked pores can lead to ingrown hairs and scaly looking skin. By including a body scrub to your routine, you can achieve smooth, rejuvenated skin. When we manually remove dead skin cells that would otherwise take close to 30 days to shed on their own, we see the fresh new layer of skin come to life. Dead skin cells left on the skin create a layer that hides the new vibrant layer of skin beneath. Exposing this new layer will give your skin a vibrant and youthful look. Allows Nourishing ingredients to be absorbed. When we remove the top layer of dead skin cells we can absorb much needed moisture and other beneficial ingredients. Scrubs that include coconut oi﻿l or jojoba oil will be able to penetrate deep into the new skin, hydrating and protecting the newly exposed tissue. Not all body scrubs are good for you, or the environment. There are many products out there that contain chemicals and even use small plastic beads as the exfoliating agent. These additives will be absorbed by the skin and drain into our water systems and soil. Eco-friendly body scrubs will benefit the skin and planet in a superior way. 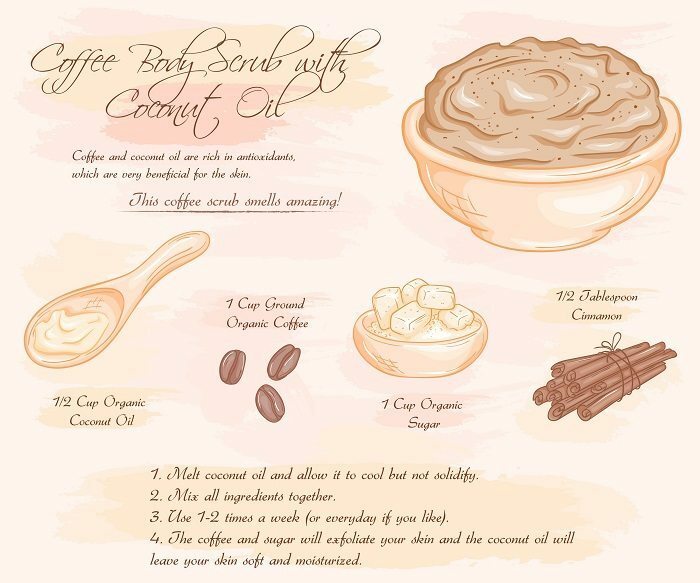 A coffee and coconut body scrub has many benefits to the skin and is totally eco-friendly. 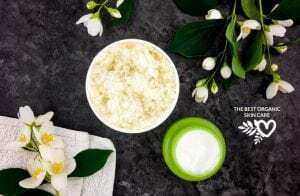 This is the body scrub we are featuring that will help improve varicose veins by increasing blood circulation as well as fight free radicals that are the cause of premature aging, just to name a few. Coffees main constituent is caffeine, and caffeine is high in antioxidants. Antioxidants are great for the skin because they fight free radicals that cause fine lines and wrinkles. When a coffee body scrub is applied, the skin absorbs this antioxidant and can help prevent premature aging. 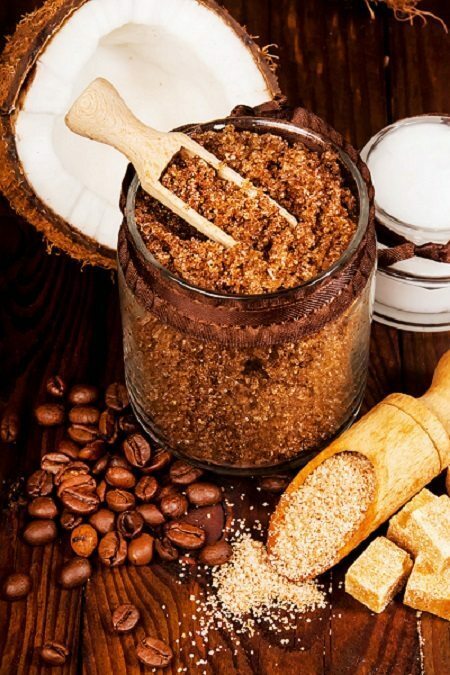 Coffee body scrubs combat the occurrence of varicose veins. The caffeine found in coffee typically increases blood flow and may reduce the appearance of cellulite. Caffeine is also a vasodilator, which means it constricts blood vessels in the skin. This action works to make blood vessels tighter and firmer very quickly, which is reflected in the skins texture. The caffeic acid found in coffee grounds can significantly affect anti-inflammatory activity and skin wound healing. Coconut oil is an amazing moisturizer and should really replace all your other overpriced moisturizers. Coconut oil is made of saturated fats which maintain moisture and keeps your skin supple and toned. Coconut oil’s high saturated fat content (92%) makes it slow to turn rancid. 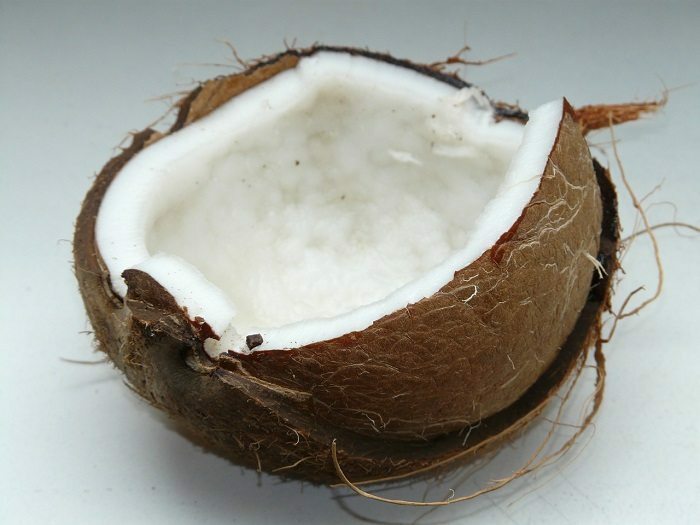 Unlike other saturated fats, coconut oil is made up of 62% Medium Chain Fatty acids (MCFAs). MCFAs are easily absorbed by the body and have antimicrobial properties, while aiding in the absorption and retention of calcium, magnesium and some amino acids. Mix all ingredients together in a bowel. Transfer your mixture to a mason jar or container of your choice. One that has a tight lid. The coffee and sugar will exfoliate your skin and coconut oil will leave your skin soft and moisturized. This is an amazing body scrub recipe and is super simple to make. A must try for those who have cellulite, inflammation, dry skin and varicose veins. Be sure to share this article with your friends !